A U.S. communications satellite smashes into a defunct Russian military communications satellite, spreading space debris that must be tracked. French and British nuclear-missile submarines ram into each other on routine patrol in the Atlantic, causing an estimated £50 million in damages. While the HMS Vanguard returned to its Scotland base with dents and scrapes on its hull, Le Triomphant remained blissfully unaware it of its collision (quel sous-marin?) until notified by the Royal Navy days later. And perhaps strangest of all, UK ITV News reports that a Lincolnshire wind turbine had its blade sheared off by a UFO. Really now. An intergalactic expedition travels light years to this speck of dust we call Earth and, like a hapless duck on migration, smashes into a turbine on a barren British field? Quel moulin à vent? Imagine ET phoning home with that news. This got me pondering, exactly how frequent are these collisions, and what factors are involved? I was under the impression that space is a vast, well, space, and given the 5,000 to 1 odds that Earth will experience a catastrophic collision with an asteroid in the next 100 years (compared to the 88,000 to 1 odds of dating a supermodel) , such collisions should be rare events. In fact, three previous collisions with space-junk objects larger than four inches have occurred. Four inches doesn't sound like much, but according to the U.S. Space Surveillance Network, which tracks over 18,000 man-made objects in low orbit (40% of which come from breakups of spacecraft and rocket bodies), these projectiles travel at 22,000 mph and can rip holes in spacecraft. Of course there are other instances of space collisions, notably, the 1997 fender bender involving an unmanned Russian Progress cargo ship (some progress) slamming into the Mir Space Station, damaging a solar array and radiator and puncturing the hull, depressurizing one of its modules. How do you say "Oops" in Russian? 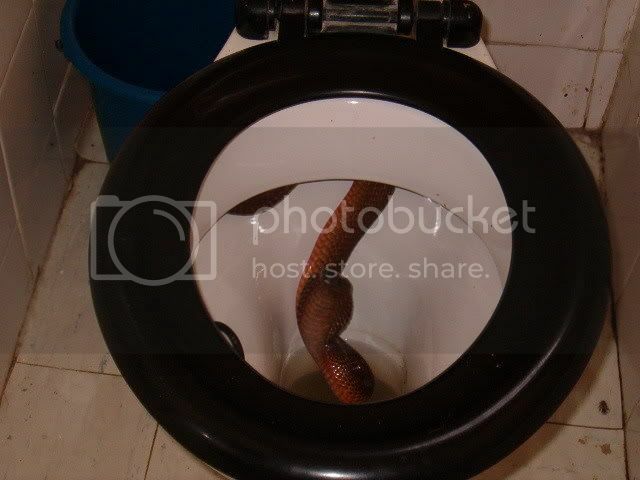 какая космическая станция? Dodging space debris in low Earth orbit is one thing. But what about submarines? Aren't they equipped with sonar technology precisely to avoid such collisions? Goes to show I know nothing about submarines...I thought calculating the odds of collision would be a simple study of how many of these vessels are on active duty. I was naive. Now I know more about SSBNs (nuclear-powered ballistic-missile subs), SSGNs (nuclear-powered guided missile subs), SSNs (nuclear-powered attack subs) and SSKs (diesel attack subs) than I ever care to know. Kursk Disaster: a leak of hydrogen peroxide in the forward torpedo room led to the detonation of a torpedo warhead. Loss of all personnel. USS Greeneville Collision with and Sinking of the Ehime-Maru: the result of poorly executed sonar sweeps, an ineffective periscope search, and distractions caused by the presence of the civilian guests aboard the submarine. 9 fatalities, including 4 students. USS Dolphin Major Flooding and Fire. Ship abandoned and later towed back to harbor; no serious injuries. USS Oklahoma City Collides with tanker. No oil leaks, commander relieved of command. HMS Trafalgar: ran aground onto the rocks at Fladda Chuain. 3 injuries. HMAS Dechaineux flooding: 55 sailors were 20 seconds from sinking to the bottom of the ocean when a seawater hose failed. Fortunately, crew members stopped the flood and rescued their crew mate from the engine room. Ming 361 Loss of All Personnel, possibly from suffocation due to malfunctioning diesel engines which consumed O2 within the interior. K-159 Sinking: decommissioned Russian sub being towed for scrapping sank in the Barents Sea, killing 9 of the 10 aboard. USS Hartford grounding: $9 million in damage. HMCS Chicoutimi Fire: poor insulation of power cables led to 2 fires that resulted in 1 death. USS San Francisco grounding: head-on collision with an undersea mount while on a high-speed run to Australia. 2 deaths, 60 injuries. The AS-28 Emergency: entangled in a fishing net, with a depleting air supply. St. Daniel of Moscow Fire: 2 deaths. USS Minneapolis-Saint Paul Incident: 4 crew members washed overboard in heavy waves, resulting in 2 deaths. USS Newport News collides with Japanese tanker Mogamigawa. HMS Tireless: explosion caused by air-purification equipment. 2 deaths, 1 injury. HMS Superb: hit an underwater rock pinnacle in the Red Sea. Russian K-152 Nerpa. 20 deaths. The lowdown: Submarine technology is exploding around the world, with over 40 countries, including China, Iran, North Korea, Russia and Venezuela having modern submarines. These submarines are cheap, mass produced, and they are readily available for just about any country. Of the 380 submarines owned by these countries, more than 300 are diesel-electric subs, in operation by 39 nations. When diesel subs operate on battery power, they are nearly undetectable without the use of mid-frequency active sonar (MFA). Yes, this is the sonar involved in the $16 million settlement between the Navy and conservationists, over the injury and death caused to marine mammals. Furthermore, diesel subs with air independent propulsion systems (AIP) can remain quietly submerged for days at a time. Because the U.S. Navy no longer operates diesel-electric submarines, it invites allied countries that own these boats to participate in exercises at Navy ranges on the east and west coasts. So what about it. Subs smashing into sea mounts. Grazing tankers. Running aground. What gives? 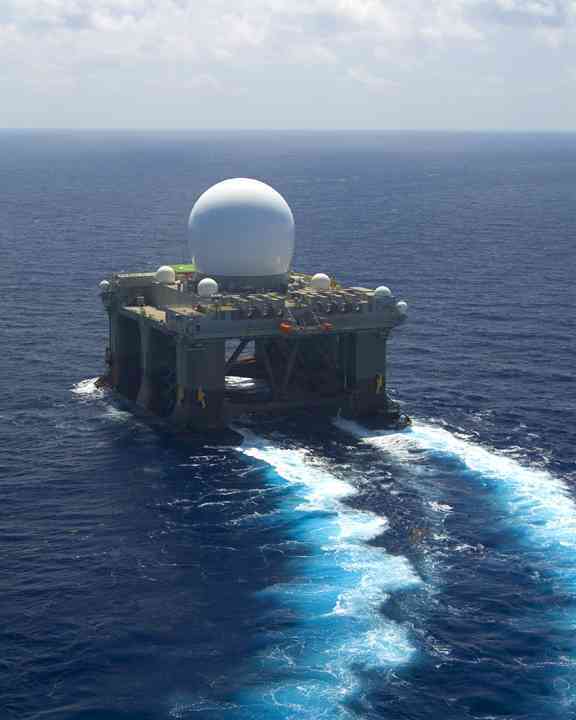 We have the technology to track a baseball spinning 3,000 miles away—Sea-Based X-band Radar, part of our missile defense system. Of course this is far different from sonar technology, but can't we do better? After all, dolphins have been using biosonar for millions of years and can discern a BB gun pellet from a corn kernel from a distance of 50 feet. Though why a dolphin would have any interest in corn is beyond me...ask the U.S. Navy, which is interested in using them in mine detection operations, particularly in the Persian Gulf. The difference, of course, is that subs play a deadly cat and mouse game utilizing active and passive sonar, and localizing a target through some tedious doohickey called Target Motion Analysis (TMA), amongst other strategies. Subs are not well-suited to exchange blows. The idea is shoot first and kill; shoot and go. There are two kinds of sonar, active and passive. Active sonar is older. You send out a signal and wait for a ping. That gives you instantaneous bearing and range. The problem is that it's fairly short range, and more importantly, it gives away your position. A modern hull mounted active sonar can produce hundreds of thousands of watts of sound energy, reaching up to around 250 decibels (dB). Compare that to the sound level of a jet engine at 30 meters distance, which is just 150 dB! Active sonar may also be your only useful choice when dealing with diesel-electric submarines, since these are extremely quiet when running on their batteries. Here's an (alarming) analogy to get an idea of just how difficult: Try to locate a refrigerator by listening for it from outside the house. With active sonar you can hear out to ten miles, but you can be heard out to 20 miles. Passive sonar is what the Navy generally uses today. Passive simply means listening to what your instruments can hear. Passive gives you bearing but not range, and it takes a long time to convert this to usable information. The temperature structure of the ocean dictates how sound moves through it. It puts bend on the sound. Submariners map out the temperature and velocity structure of the water to figure out where to hide. Detection is difficult. It's hard to classify sounds. Localization is also difficult. Tracking is easy if you have steady contact, but with a lot of turning, this is difficult too. Engagement depends on knowing where the other guy is. Because subs have to surface to communicate, they don't work well with others. The ability to communicate while deep is the naval Holy Grail. So dueling subs is like a knife fight in a phone booth. To make matters worse, there's a sonar dead zone, the baffles, which is 15-degree wide cone "extending aft from the stern, in water disrupted by the screws and the vessel's own passage." Okay. So that explains, I suppose, how subs go bump in the deep. And why they smash into humongous sea mounts...a combination of piss poor mapping and the annoying silence of underwater topography. 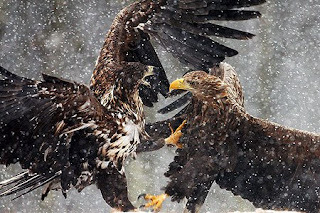 Clash of eagles, Poland. 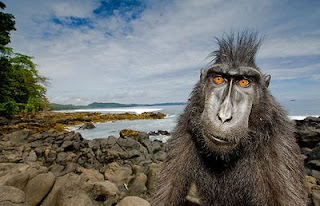 By Antoni Kasprzak, Wildlife Photographer of the Year 2008. 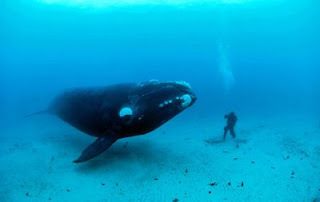 An adult Southern Right Whale, (Eubalaena australis) encounters a diver on the sandy sea bottom at a depth of 22-meters off the Auckland Islands, New Zealand. Photograph by Brian Skerry. 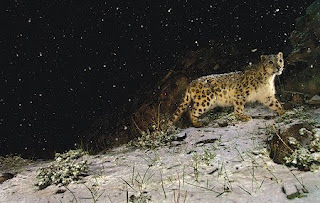 Snowstorm leopard winner of the Gerald Durrell Award for Endangered Wildlife. 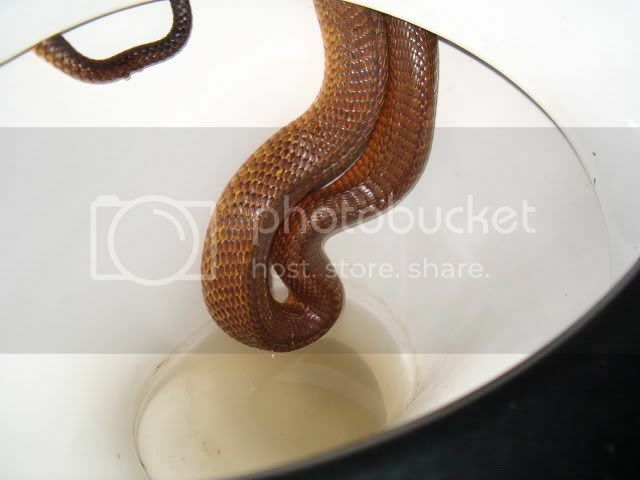 Photograph by Steve Winter. Sub-adult male black crested macaque, Indonesia. Phoptograph by Stefano Unterthiner. 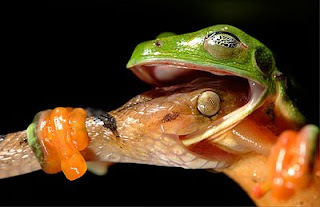 A critically endangered Morelets tree frog, Agalychnis moreletii, battles for its life with a cat-eyed snake. Chiquibul Forest Reserve, Belize. Photograph by David Maitland. "If we give the money to the widows, they will spend it unwisely because they are uneducated." Actually, this sounds vaguely familiar... kind of like Rush Limbaugh's comments about the Liberal agenda to erode the institution of marriage by giving welfare to single women and their children.